Would you like to allow others to print the page-flip book with your brand printed? Hide the flip page translucent white edge? If you have used our software, you could notice the page edge which is white and translucent. Most users want to hide it seems redundant. If it can be hided, the flipbook would look more perfectly. Of course, many people still like it because it always guides visitors to begin flip. 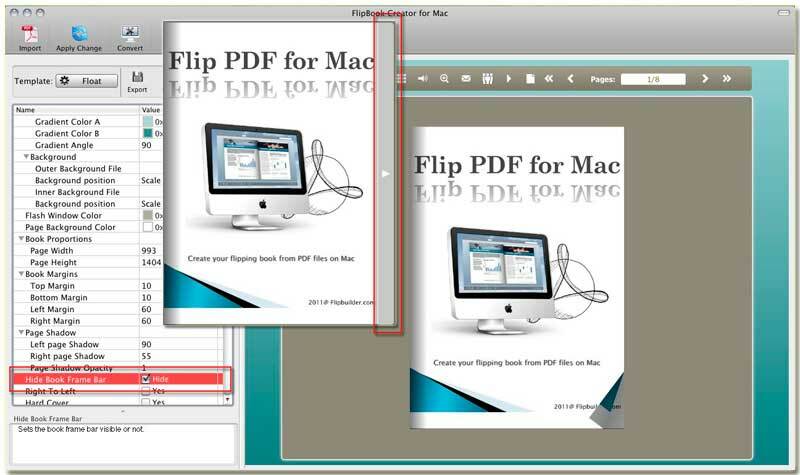 To make satisfaction for all the requirements, FlipBook Creator for MAC provide the switch which allows you hide it or not. Step1: Start FlipBook Creator for MAC, and then move the mouse to the left area of settings. Step2: Look down to find then option of Hide Book Frame Bar and check it. Finally click the top button of Apply Change.